WHO is seeking input on draft guidance for managing human exposure to live polioviruses from poliovirus-essential facilities such as labs and vaccine plants. Containment includes biosafety and biosecurity requirements for laboratories, vaccine production sites, or any other facility that handles or stores eradicated polioviruses, to minimize the risk of these viruses being released into the community. 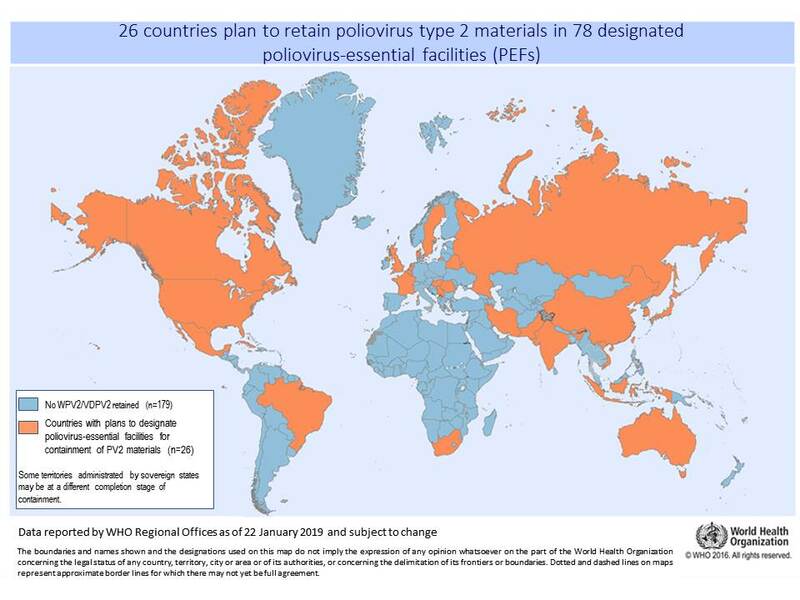 Containment of eradicated polioviruses is a key objective of the Polio Eradication and Endgame Strategic Plan 2013-2018, and will be critical for maintaining the global polio-free status. In September 2015, the Global Commission for the Certification of Eradication of Poliomyelitis declared that wild poliovirus type 2 has been eradicated. Wild poliovirus type 2 is the first of three wild poliovirus types to be eradicated. However, laboratories and facilities worldwide still handle or store the virus for activities such as vaccine production or research. It is important that all poliovirus type 2 is destroyed, or safely and securely contained so the virus is not released from facilities that retain it. After each type of poliovirus is eradicated, certain laboratories and facilities will continue to retain the virus for critical activities such as vaccine production and research. These poliovirus-essential facilities will be the only place the virus continues to be found. The accidental or deliberate release of the virus from one of these facilities following eradication could result in the return of polio to once again cause paralysis and death. Minimizing the number of poliovirus–essential facilities reduces the risk of release of the virus and allows for strong national and international oversight of containment activities, strengthening the likelihood that global containment standards can be met and maintained. Activities are underway to ensure that all poliovirus type 2 materials are destroyed, or safely and securely contained. Countries have conducted national inventories of facilities that handle or store wild and vaccine-derived poliovirus type 2, and have destroyed unneeded virus. They have designated facilities that will retain the virus where it is needed and are preparing to undergo the certification of these designated poliovirus-essential facilities. Similar activities for facilities that handle or store OPV2 and Sabin2 materials are in progress. 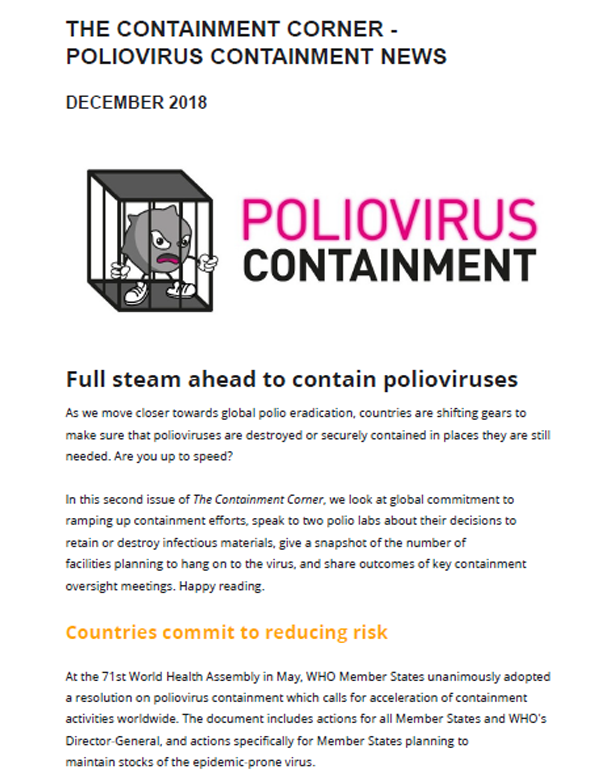 At the 71st World Health Assembly, Member States adopted a resolution which urges the intensification of efforts to accelerate progress towards poliovirus containment globally. Data reported by WHO Regional Offices as of 22 January 2019 and subject to change. 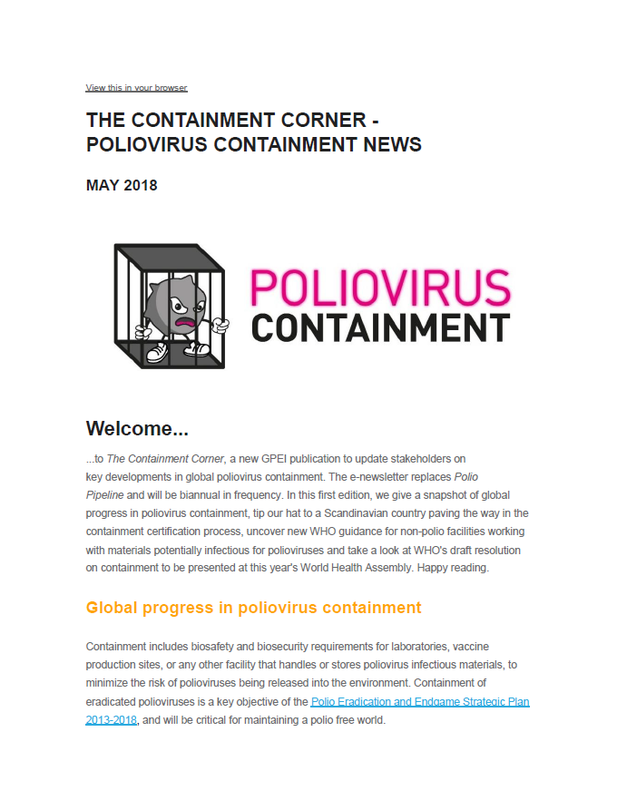 The Containment Corner – Poliovirus Containment News is a GPEI publication to update stakeholders on key developments in global poliovirus containment. The e-newsletter replaces Polio Pipeline and will be biannual in frequency. It is available in PDF format below. Subscribe to receive the publication by email.